Read my reviews of issue #1 and issue #2. Last time, Leia, Evaan, and R2-D2 successfully rescued some Alderaanians from Naboo. “Orbiting the fiery Outer Rim planet of Sullust aboard their newly acquired ship, the Lord Junn, the team has just found another cluster of survivors, only these may not be as welcoming as the last. Unbeknownst to the crew, one of their own is feeding their every movement directly into Imperial hands. With the bounties adding up, it’s only a matter of time before the Imperials catch up with her Royal Highness…” Issue #2 was filled with adventure, betrayal, and dancing. Who knows where #3 will take us? Also, the person feeding their movements isn’t doing it on purpose; she’s just calling her sister, who happens to be an Imperial officer. We’ve never seen a lady Imperial officer, so that’s pretty cool. The issue opens on the sisters; Tula, the officer, feeds where Leia and the Alderaanians are to her commander, who says that she scores “very high on obedience, but rather low on loyalty.” I’m hoping she finds a way to betray the Empire without getting force-choked to death. The Lord Junn drops off Leia, Evaan, and R2 to the Alderaanian enclave on Sullust; they are none too happy to see the princess. Their Sullustan guide, Mr. Tivvy, says that he thinks “that the local Alderaanians have gone insane.” They’ve also cut off all communication from outside the compound. After they learn that they pooled all their money and bought the land they’re on, the rifle squad shows up. Leia, Evaan, and R2 make short work of them in a brief but effective fight scene (KRAK WHUMP ZRRK!). R2 comes up with a wild plan (do all astromechs have the ability to become this plucky? ), and the Empire decides to hang back and see where Leia goes next instead of ending her journey here. I think the first two issues were a bit stronger than this one, but it did have some excellent moments for everyone. Only two issues left in this mini-series, but don’t worry; Lando’s getting his own soon, and you can bet I’ll be reading (and reviewing!) that. 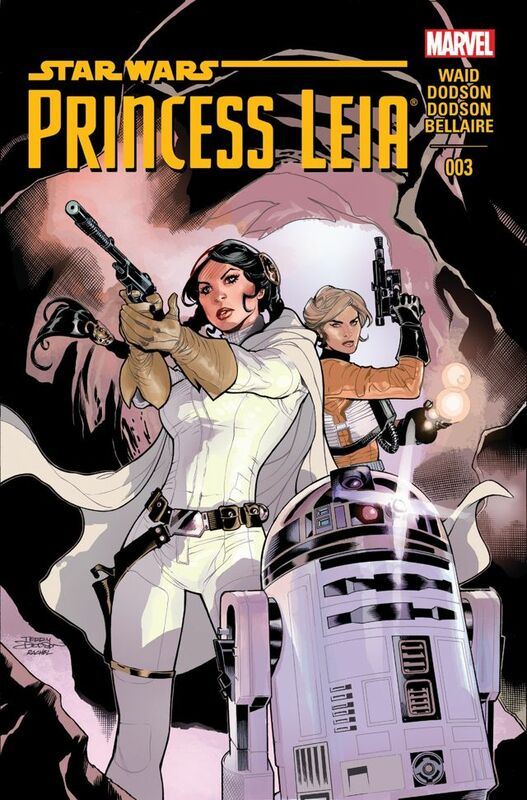 Issue #4 of Princess Leia will be out on 5/27! Get issue #3 from Comixology, Marvel, or your local comic book store for $3.99.